Grass slopes can be quickly and easily reinforced for stabilization and golf cart access. Frequently used paths can be reinforced. Paths can be reinforced for course maintenance equipment. 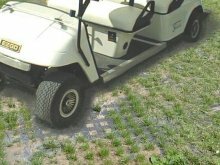 Perfo tiles are ideal for golf cart paths. Installation is simple without the need for ground excavation. 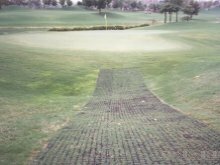 They can be used to reinforce complete golf cart tracks or simply as a grass reinforcement solution for areas prone to damage. 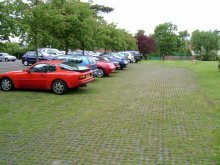 Perfo tiles are the cost effective and quick solution to overflow parking problems. Grass areas can be quickly and easily reinforced to carry vehicle traffic throughout the year. Installation without the need for excavation means that the ground is out of use for very little time. The Perfo system can be used immediately following installation.